If you’re looking for a career with excellent pay and benefits, great working conditions, rewarding work, and opportunities to advance in a strong, growing industry, you’re in the right place. 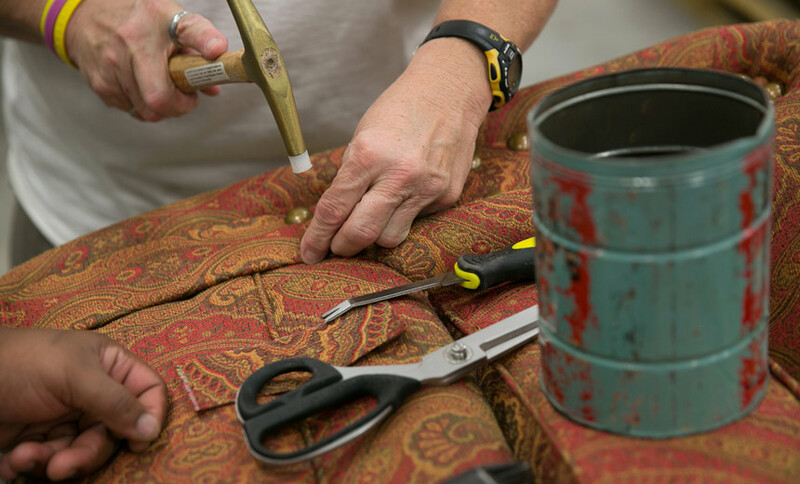 In today’s world-class furniture facility, skilled technicians use state-of-the-art equipment to cut, sew, frame, fit, and upholster beautiful, high quality products for an expanding global market. If you like to work with your hands, are detail-oriented and willing to learn, you can start training for a beautiful career today. Trained technicians start at $15/hour and can earn up to $30/hour, depending on their job type and experience level. Different companies offer different packages, including health insurance, paid vacation and holidays, 401K retirement plans, performance bonuses, and more. No worries about the weather; rain or shine, hot or cold, day or night, your work space will be dry, safe, clean, well lit, warm in the winter and cool in the summer. Crafting a variety of furnishings, some completely customized, you’ll solve new challenges every day, and when the day is done, you can point with pride to the products your hands helped create. As you gain experience and grow your skills, you can take on new challenges, earn more, and move into supervisory or managerial positions. Area manufacturers may have openings on their training lines today. Two community colleges are accepting applications. And if you’re already experienced, you’re already in demand. Find the job that works best for you as you learn from experienced craftsmen in a true-to-life manufacturing facility. Explore job opportunities available at area furniture manufacturers.